Email me <-- (click on the link) Podcast hotline: 206/984-3136 Leave comments by using the link shown below If you have not done so already, please subscribe to this podcast (via iTunesâ„¢) so you can receive all episodes automatically. If you have not done so already, please subscribe to this podcast (via iTunesâ„¢) so you can receive all episodes automatically. It is very important for you to participate by suggesting additional topics (key principles or characteristics), making general comments, telling stories about your experiences with good (or poor) leaders, or asking questions to be addressed on the episodes. What does leadership mean in a growing community? What organizations in a community will help young people become stronger leaders? What are the characteristics you have found among others you consider as leaders that have helped you become a stronger leader? This exciting episode features a compelling interview with Dr. Evangeline Stefanakis, renowned author of Multiple Intelligences and Portfolios: A Window into the Learners Mind (link to the book is shown below). 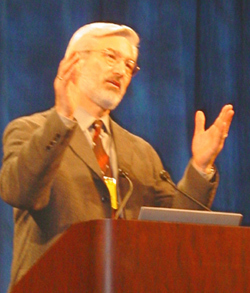 This interview was recorded in Atlanta, Georgia during the National Educational Computing Conference in late June, 2007, immediately following a presentation I had just finished co-presenting with Dr. Gordon Dahlby of West Des Moines, Iowa. Dr. Stefanakis joined me at the front of the room for this chat, so I pulled out my iPod, connected the Belkin stereo microphone, and began recording. I am so impressed with all the things I learned from Dr. Stefanakis, as well as the inspiration and provocative energy she imparted for all listeners to this podcast. If you would like to contact Dr. Stefanakis, remember that she will be moving to Boston University, effective August 1, 2007. Thus, the BC address is the one I provide in the link here. If you wish to contact her at Teachers College, Columbia University, she gives that email address in the podcast episode. I encourage you to send in your comments and/or questions so we can use them in a future episode. I know that many of you have compelling stories that will interface well with the content of these three episodes. So, I encourage you to participate by sending in your material. The final installment of our 3-part series devoted to: How Leaders Deal with Adversity. Panelists included: Dr. Sam Pace, MD -- a noted gastroenterologist in Tupelo, MS Dr. Mary Pace, MD -- a physician who has her own private practice and who deals often with traumatic conditions (also, Dr. Sam Pace's wife) Vickie Ramsey -- an instructor at Northeast Mississippi Community College. She also has authored a book, Humor 'n Healing about her experience with breast cancer. Kristi Brown -- a popular speaker, author, and life coach. Kristi's book, To Walk on Fertile Ground: Extraordinary Living through Infertility and Cancer, is just hot off the press. The original recording took place in December 2006; however, the entire program lasted for almost 1.5 hours. So, I split it into three parts. This episode is Part Two of the 3-part program during which I interviewed four outstanding local leaders. Our topic for the discussion was How Leaders Deal with Adversity. Each panelist is particularly well-qualified to speak about this matter. The original recording took place in December 2006; however, the entire program lasted for almost 1.5 hours. So, I have split it into three parts. Part Three will follow this episode in approximately one week. As you listen to this episode, I encourage you to make notes, then send in your comments and/or questions so we can use them in a future episode. I know that many of you have compelling stories that will interface well with the content of these three episodes. So, I encourage you to participate by sending in your material. Recently, I had the privilege of convening a panel of individuals who are recognized locally as strong leaders to discuss the important topic, How Leaders Deal with Adversity. This was a most informative and provocative interview. Dr. Sam Pace, MD -- a noted gastroenterologist in Tupelo, MS Dr. Mary Pace, MD -- a physician who has her own private practice and who deals often with traumatic conditions (also, Dr. Sam Pace's wife) Vickie Ramsey -- an instructor at Northeast Mississippi Community College. She also has authored a book, Humor 'n Healing, about her experience with breast cancer. Kristi Brown -- a popular speaker, author, and life coach. Kristi's book, To Walk on Fertile Ground: Extraordinary Living through Infertility and Cancer, is just hot off the press. You'll want to email Kristi and request a book, ask a question, or make a comment. The original recording took place in December 2006; however, the entire program lasted for almost 1.5 hours. So, I have split it into three parts. Parts 2 and 3 will follow this episode approximately one week apart. Great leaders often do the small things in big ways. And, many times, this means they do "just a little bit more" than is required. That's what gives them the competitive edge over their competition--that razor's edge! Greet others first Smile! Be courteous Offer help before it's sought Send cards or letters to offer a word of encouragement, thanks, etc. Return phone calls promptly Check your email messages to ensure that they aren't harsh or could be misinterpreted Read Good to Great by Jim Collins and Psychology of Winning by Denis Waitley. These are just two of the many books I consider essential in a leader's library. Remember, "all leaders are readers." Seek ways to make others' jobs easier and faster Value others' opinions Apologize if wrong has been done. True/effective leaders take personal responsibility for their errant actions. Share: Are iTunes and iPods evil??? My guest this episode is Sheriff Jim Johnson from Lee County, Mississippi (my home of Tupelo is in Lee County). As you will hear in this episode, there is another famous person who was born in Tupelo and Sheriff Johnson has some connections to this person's family. During our conversation in Sheriff Johnson's office, he outlined several aspects of what makes an effective leader. He gives several examples of how these principles have been put into action in his life. Share: More podcast episodes coming soon! 010 - Dragons, Lions and Skunks, Oh My! Share: 010 - Dragons, Lions and Skunks, Oh My! Share: 009 - Unflappable Friends! 008 - Phony Pepperoni Anchovy! Share: 008 - Phony Pepperoni Anchovy! Share: 007 - Flat Bats! Share: 006 - Floatable Boatables! 005 - The Great Horseback Roller Coaster Canoe Ride! Share: 005 - The Great Horseback Roller Coaster Canoe Ride! Share: 004 - Buzzworthy Buzzooligans! 003 - Green Sock, Blue Sock! Share: 003 - Green Sock, Blue Sock! 002 - Purple Space Alligators! Share: 002 - Purple Space Alligators! 001 - Itsy Bitsy Sock Spider! Share: 001 - Itsy Bitsy Sock Spider! Then, there was one more very special submission by Dr. Pat Horn, an Apple Distinguished Educator from Florida. Pat called the Think Like A Leader hotline (206/984-3136) and left an audio message. The crux of her submission is: vision, dedication, caring spirit, persistence ... but she summed up all this by saying a leader must be "a visionary who leads by doing." I appreciate all the feedback that you sent in. Now, I am putting out a Call for Help on a few issues: Book Reviews -- I promised you some reviews of books on leadership and related topics. A few of them have been included in previous episodes; however, I want to give you a great many more. In order to accomplish this, I need some of you to record a brief audio file in which you give a 1-2 minute synopsis of some book that has meant a great deal to you. Send your files to me at larry@nctp.com. Your Most Admired Leader -- I need you to create a short audio file (30 seconds - 2 minutes) and tell me who your most admired leader is, and why. I would like to play some of these audio submissions on a future episode. Music for Podcast -- Although I have been using music composed by Ted Scalzo in New York, I would like to get some more of you to send some music that I can use as bumpers/clips/jingles for the: opening; transitions; and closing. I know you are great musicians, so please send me your stuff and we'll highlight it on a future episode. The three of us gathered in Mike's conference room to discuss elements of leadership that had made the two young gentlemen as successful as they are. As you might imagine, they both were quite modest, seeming unwilling to accept the accolades I offered them. They talked about the importance of each other's organization as a key component in the North Mississippi region's growth. This is one mark of a great leader--a willingness to offer credit to others for the achievements they have engendered. During our one-hour interview, they discussed the conscious decision by CREATE to host a leadership enhancement program for young leaders in the region. Enhancement was the focus rather than mere development, because they want to make sure they build upon the successes existing in the area, already. Yet another mark of a stellar leader--concern and consideration for those around you! I want to offer a special word of commendation and thanks to Jeff Sewell, owner of Sewell and Associates, a local audio/video engineering firm. Jeff spent several hours helping me figure out some new equipment I had bought. Plus, he loaned me some new microphones to test. But, the most help came when, after I recorded the session, I couldn't believe how much hiss had been recorded (I definitely didn't have the same thing coming through my headphones as what wound up on the recorder), so he helped me figure how to diminish that with Soundtrack Pro. Please bear with me as I learn proper ways to use this new equipment and software for podcasting. Dr. Bob Phares, Asst. Supt. in the Enterprise (AL) School District Al Denson, a successful Christian musician, author, radio & TV personality, and entrepreneur. Al is my nephew, but I admire him for his enthusiastic leadership style -- and how he leads others by living his life as a stellar example of excellence Norma Cother, managing broker for Crye-Leike Realty in Tupelo, MS. I consider Norma a great friend whom I admire for her impeccable ethics. Her reputation for integrity, honesty, and warm personality is sterling. Norma's brand new podcast, Blueprint for Real Estate Success can be found in the iTunes Music Store, as well. Share: Definition of Leadership: What Do You Say?